Based on the classic “Cyrano de Bergerac” originally written in French verse by Edmond Rostand in 1897, this translation by Michael Hollinger adapted for the stage with Aaron Posner is a successful reinterpretation using a more modern dialog that preserves much of the courtly charm necessary to the play’s setting. The title character of Cyrano (Michael B. Woods) is an accomplished courtier in 17th Century France, an unparalleled master of the sword and the word whose personal relationships are hampered by what he perceives as a hideous deformity, namely a grotesquely enormous and unsightly nose. Cyrano conspires with a fellow comrade-in-arms, Christian (Zach Livingston) to woo and win the affection of the lovely Roxane (Vahishta Vafadari). 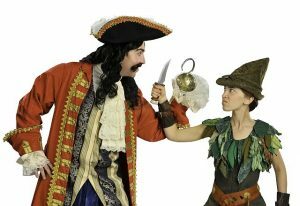 Christian will supply the good looks while Cyrano supplies the requisite language of love. Cyrano’s own self-hate is his worst enemy that keeps him separated from his desire. The fight choreography by Jon Beal was a highlight of this production making me wish that the same level of effort was put into the rest of the lackluster performances. Since none of the actors seemed fully invested in their characters I must set the fault at the feet of Director Steve O’Connell’s ability to rally the troupe. Though this adaptation aims to “ditch the pretentions” it should not be at the expense of nuance and the basic humanity of the characters nor the charm of the language. Here the actors rely too heavily on the words to do all of their heavy lifting and doing little to breathe life into their respective roles. BoHo is intended to be “a launching pad for up-and-coming actors” but in this case was a lost opportunity to show us what you got. This Cliff’s Notes version provides a few memorable moments provided mostly by the text and is a good introduction to the book however, it definitely lacks panache. 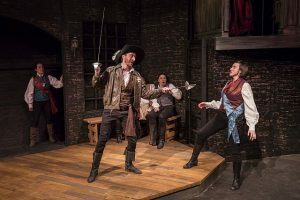 DETAILS: ‘Cyrano’ by BoHo Theatre at Theatre Wit, 1229 W. Belmont in Chicago runs through April 15, 2018. For tickets and other information call or call (773) 975-8150 or visit BoHoTheatre.com. ‘Hedda! 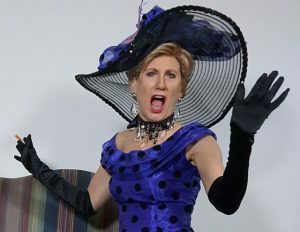 A Musical Conversation’ is a very entertaining one-woman show at the Athenaeum Theatre starring Jillann Gabrielle as legendary Hollywood gossip columnist Hedda Hopper. Written by Gabrielle with book and lyrics by Michael Termine and music by with Howard Pfeifer, ‘Hedda’ is a one-act play that takes place from the mid 1940s through the late 1950s in Hedda Hopper’s living room. Tasteful furniture, a rolling cart of favorite drinks , clothing racks with dozens of the hats she was famous for wearing and that prime necessity for a gossip columnist, a phone, set the scene for a fun 90 minute peek into the life Hedda Hopper. Gabrielle’s performance as Hedda is superb as she walks and sings the audience through a life that went from Quaker upbringing to bit MGM player and then famed columnist. Lively phone conversations and clever songs such as as “Hedda! Queen of Hollywood,” “Off the Record” (there’s audience participation), “Elizabeth, “Hats!” and ‘Don’t Drink the Punch” reveal much of her story. And when the audience hears her say, “Hello, Elizabeth” or “Joan,” or “Marlene” and others, everyone knows who’s there. Hedda had an amazing effect on not only the motion picture industry, but on politics, as well. Her song “I’m Political” describes her conservative values and moral views as her columns go after Charlie Chaplin and other Communist sympathizers. She also had famous heated discussions with many of Hollywood’s elite including the Elizabeth Taylor/Eddie Fisher/Debbie Reynolds trio. Her column had a readership of over 30 million, and it set the stage for many types of columns today. DETAILS: ‘Hedda! A Musical Conversation’ is at the Athenaeum Theatre, 2936 N. Southport, Chicago, through March 17, 2018. Running time: 90 minutes with no intermission. For tickets and other information, call 773-935-6835 or visit AthenaeumTheatre. For those who aren’t familiar with the revised musical ‘Merrily We Roll Along’ based on the book by George Furth with music and lyrics by Stephen Sondheim, prepare yourselves for a wide range of emotions while observing the lives of three close-knit friends over many decades. The original Broadway play written by George S. Kaufman and Moss Hart in 1934 evolved into a musical in 1981 that barely survived. 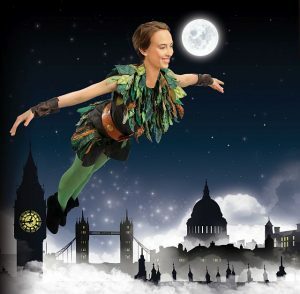 Fortunately, Sondheim and Furth revised the show in 1994, which is now a fabulous production at Porchlight Music Theatre at The Ruth Page Center for the Arts. 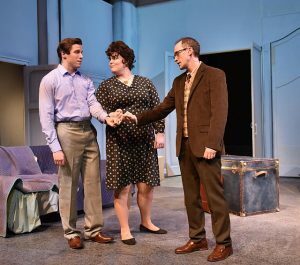 (L to R) Jim DeSelm (Frank, Neala Barron (Mary) and Matt Crowle (Charley) in ‘Merrily We Roll along’ at Portchlight Music Theatre. Photo by Michael Courier. Directed by Michael Weber with music director Aaron Benham, this remarkable musical is presented in reverse chronological order with the years posted on the stage’s backdrop so that the audience can easily follow the three friends’ relationship— easily, but not always merrily. The trio of friends includes Franklin “Frank” Shephard (Jim DeSelm), a talented musician whose objective is to make money—and who eventually succeeds by marketing to influential folks who can help him. His longtime friend is Charley Kringas (Matt Crowle), a wonderful lyricist who doesn’t want to follow Frank’s ways of reaching his goal. The trio includes Mary Flynn (Neala Barron), a writer and friend to Frank and Charley but whose longing for Frank is slowly uncovered while the play continues going back in time. ‘Merrily We Roll Along’ also reveals other relationships. 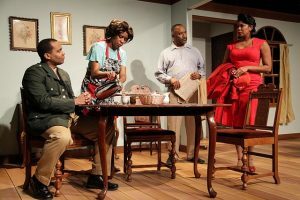 Frank’s marriage to his first wife, Beth, (Aja Wiltshire), is destroyed by his affair with Gussie Carnegie (Keely Vasquez). Beth sings “Not a Day Goes By” as she gains custody of their young son while she and Frank divorce. We first observe the three friends at beginning of the play where they’ve already achieved success despite painful experiences that ruined their relationship. Then we travel back so that at the end of the play, we see their friendship decades earlier as they try to launch their careers. In addition to the five major outstanding cast members, the rest of the exceptionally talented cast of over twenty men and women also bring their extraordinary voices to the musical numbers. They are accompanied by seven marvelous musicians. This play may not be for everyone, but for those who enjoy intellectual stimulation and are willing to sit back and contemplate some of the harsh realities and complexities of the human experience, this is a performance you will not soon forget. 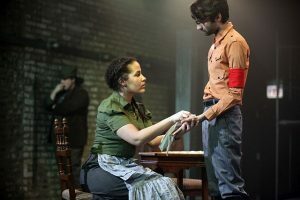 Just the title, ‘Fear and Misery in the Third Reich,’ a grim tale by Bertolt Brecht and translated by Eric Bentley, is enough to discourage a sizeable percentage of theater goers looking for the next feel good musical but this is theater at its best, relevant and thought provoking. Simon Hedger, l, and Joe Bianco in Haven Theatre’s production of ‘Fear and Misery in the Third Reich. Photos by Emily Schwartz. Brecht is one of the leading playwrights of the twentieth century who courageously stood up for injustice and openly shed a light on the social and political changes that were transforming his life and the lives of people around him. Then it occurred to me that it would be like taking a few movements out of a Beethoven symphony. It is as long as it needs to be. The production is a series of well orchestrated vignettes that explore the impact of Nazism on German society. Each carefully crafted segment represents a different aspect of the social strata and/or one of the essential institutions that comprise our sense of community. These include the institutions of friendship, love, marriage and family as well as public institutions of mercantile, manufacturing, and government. All of which require “trust” and “honesty” to function properly. To some, the themes will resonate with the politics of today. That is not to say that life in the U.S. in 2018 is anything like Nazi Germany in 1938 but it may be a cautionary tale of what can happen when the seeds of mistrust are sewn and paranoia blooms. Brecht was writing in an era before television and the Internet, where newspapers, theater and radio were the communication technology of the day. Even talking pictures were a relatively new phenomenon. The point being that words and the subtlety of language was paramount. A genius of dialogue, in this play Brecht has a way of writing conversations that sound like a person’s inner thoughts or self-talk being spoken aloud. The result for the audience is a sense that these are your own thoughts. It puts you into the brain of the character and creates a strong feeling of intimacy. Psychodrama is a therapeutic tool developed around this period intended to help people struggling with inner conflicts to confront their most intimate thoughts by acting them out. No doubt Brecht was inspired by this technique but used it in a most public way. Director Josh Sobel has done a good job with this group of young actors. The competent Haven Theatre ensemble made their way through this marathon production at a good pace with a few outstanding individual performances. This is the kind of play that brought about method acting. It requires the actor to “dig deep” and expose his or her own emotions. I am not certain that every cast member has gotten to that level at every moment but this will be a process that will certainly develop over the run and will no doubt have inconsistencies from day to day, but that is the beauty of live theater. The austere set design by Yu Shibagaki may shock you as you enter the performance space, but it is thought provoking and lends itself well to the production. The lighting (Claire Chrzan) and sound design (Sarah D. Espinoza) as well as the movement direction of dramaturge Abhi Shrestha adds thoughtful artistic depth. A personal note. I had the good fortune to witness history as an eleven year old actor (Crown Prince Medici) in the Goodman School Theatre production “Life of Galileo” starring blacklisted stage legend Morris Carnovsky, directed by blacklisted actor Howard Di Silva in a play written by a blacklisted playwright Berthold Brecht. 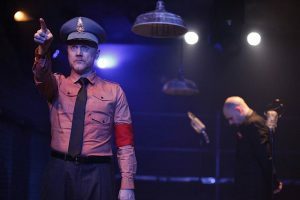 Though Brecht wrote this play about the censored astronomer in reaction to the Nazi experience it unfortunately found new relevance in the McCarthy Era illustrating the importance to remain ever vigilant to potential fascism. The World Premiere of ‘Traitor’ at A Red Orchid Theatre is an adaptation of Henrik Ibsen’s ‘An Enemy of the People. Red Orchid ensemble member and playwright, Brett Neveu, adapted Ibsen’s drama and placed it in a fictional northern suburb of Illinois called East Lake. Directed by Michael Shannon who is also an ensemble member, a founding member of A Red Orchid Theatre and a Tony Award-nominated and Oscar-nominated actor, ‘Traitor ‘is filled with one dozen inter-related characters whose different opinions and goals lead to heated discussions, sudden humor, angry arguments, profanity, and physical fights. Dr. Tom Stock (Guy Van Swearingen) is the play’s lead, a science teacher who was raised in East Lake, moved away, and returned to his hometown many years later to help establish a new charter school to revitalize the small suburb of East Lake and bring others to the suburb. His wife, Karla (Dado), is a book editor. Their two children, Molly (Missi Davis) is a first-grade teacher and Randal (Nation Henrikson), is a student at the new charter school. While teaching at the charter school Tom notices the sluggishness and apathy of some of his students. That leads him to send samples of the school’s area soil to another scientist who finds it contaminated with dangerous levels of lead. Tom is adamant to bring this severe problem to the town’s attention. He is convinced that with many of his contacts he will be successful. His outspoken sister, Patty Stock (Kirsten Fitzgerald), is the town’s mayor. A close friend of his is Walter Hove (Larry Grimm), a newspaper editor. Madison Bills (Kristin Ellis) is an associate editor. 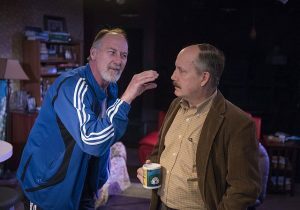 Most of the play’s scenes take place in Tom and Karla’s home where their friends and family are constantly coming in and out to visit, share meals, have drinks, and smoke. But when Tom learns that many local investors in the charter school, including his father-in-law, Howard Kihl (Frank Nall, do not want to expose the school’s lead contamination, he realizes that he alone must release the truth. Tom is reminded by his wife that many people in his past didn’t like his energy, especially when he stood up for what he believed in, regardless of others’ opinions. Tom’s retort compares “scathing with honesty” and calls them “interchangeable,” as he devotes every minute to exposing the soil’s contamination. Following intermission, the audience is led from Red Orchid Theatre to an empty storefront a few doors down. It is set up as the location for East Lake’s town council meeting which grows from verbal arguments over the school’s lead contamination to physical violence. After feeling like town residents attending the council’s meeting, the audience is led back to their seats at the Red Orchid Theatre for the final scene which focuses on Tom’s goal to convince the East Lake residents to face their town’s serious health issue. Tom’s wife, Karla, finally sides with her husband when their son, Randal, is rushed to the hospital with lead poisoning. The rest of the very talented cast includes Jenn Sheffer (Natalie West), a shop owner and council member. The other council members are Fran Wysocki (Mary Jo Bolduc), Bill Strand (Stephen Walker) and Eric Rhyde (Jacob Alexander). DETAILS: ‘Traitor’ is at A Red Orchid Theatre, 1531 North Wells Street, Chicago, through February 25, 2018. Running time: 2 hours and 30 minutes. For tickets and other information, call (312)943-8722, or visit A Red Orchid Theatre. If you are a fan of macabre humor you will love this insight into Poe offered by Black Button Eyes Productions’ talented ensemble. Cast of ‘Nevermore’ at The Edge Theater. The show runs through Jan. 28, 2018. Photo by Cole Simon. 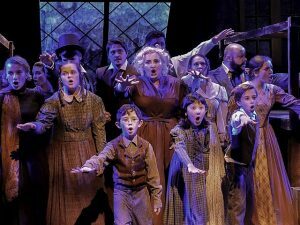 A musical written by Jonathan Christenson (book, music and lyrics), it investigates the life of one of America’s favorite poets and novelists purported to be the father of the modern detective mystery as well as a talented spinner of tales of horror and suspense. Act One covers separation and death in the young boy’s life as well as his proximity to mental illness which together with an active imagination combined to create horrific visions and fantasies. Act Two continues to explore the impact of his youthful experiences on his life and his work culminating in a suggestion of mystery surrounding his abrupt and unexplained demise. Though the material is dark it is skillfully balanced by a lighthearted tongue-in-cheek humor that keeps it entertaining and fun. The production is brilliantly cast. 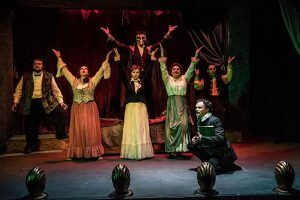 Each of the seven performers Kevin Webb as Edgar Allan Poe with Megan DeLay, Jessica Lauren Fisher, Ryan Lanning, Matt McNabb, Maiko Terazawa and Jeremy Trager could not be more perfect for their respective roles. There is no competition on stage or mugging for the spotlight. Director, Ed Rutherford seems to have a clear vision that is well executed including important lighting (Liz Cooper) and sound effects (Robert Hornbostel). The surprise treatment of Poe’s great love “Sissy” is charming. Music Director Nick Sula with the aid of his three piece band including synthesizer does an outstanding job setting and maintaining the fast pace that keeps the action moving. If you are familiar with the works of Poe you cannot help but anticipate what they will do with his famous poem the “The Raven” which does not disappoint. If you are a fan of vocal harmony you will love this score. Though lacking a real breakout number, Christenson’s music is very sophisticated and has a modern but slightly nostalgic feel that lends itself perfectly to the historic storyline. 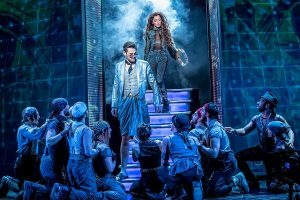 Every performer has a beautiful voice – so much so that I would be willing to watch this as a concert without the splendid costumes of Beth Laske-Miller and campy choreography of Derek Van Barham. The venue is super comfy with great sightlines and sound system operated by Kirstin Johnson was well modulated making the rapid musical dialogue easy to hear and understand. DETAILS: Nevermore: The Imaginary Life and Mysterious Death of Edgar Allan Poe, is at The Edge Theater, 5451 N. Broadway Ave., Chicago through Jan. 28, 2018. For tickets and other information visit Black Button Eyes Productions. Guest reviewer Reno Lovison is a proud alum of the Egdar Alan Poe Elementary School (K-5) in Chicago’s historic Pullman neighborhood.